When making a movie, a film maker has to take into great consideration how they are going to compose each shot to make the scene the best it can be. There are many methods a film maker uses in order to compose their shot. One method is using deep focus. Deep focus is used when it is necessary for the audience to see what is going on in the foreground and the background; when all planes are visible to the viewer’s eye. This technique also simulates that objects in the background plane are farther away than objects in the foreground plane. According to Ramaeker (2007), many directors use something called a split-diopter lens to achieve this effect. “Basically, the split-field diopter lens is a supplementary lens, augmenting the camera’s primary lens in order to create depth of focus not possible with the primary lens alone…the split-field diopter lens simply permits focusing on a very close object on one side of the frame, while a distant subject is photographed normally through the uncovered portion of the primary lens; in this way, the shot may be focused on both near and far subjects simultaneously” (Ramaeker, 2007). Comedy films generally use deep focus framing to enhance comedic elements of the film. For example, the movie “The Proposal”, starring Sandra Bullock and Ryan Reynolds, is a film about a horrible Canadian female boss who is getting deported so she makes her male assistant, who despises her, marry her. To make the marriage believable she has to travel with him to his hometown of Alaska to visit his family for his Grandma Betty White’s birthday. In one particular scene, she is outside on the phone with one of her superiors and she accidentally lets the family dog out, which she was previously instructed not to let out of the house because of the vultures that will try and scoop the miniature dog up. While on the phone, the vulture catches the dog and she is running around trying to get the dog back. She finally does, but then the vulture comes back and takes her phone. So, she runs after the vulture carrying the dog screaming at the bird to take the dog instead of her phone. Then, the shot jumps to Reynolds’ character’s mother and grandma who are now in the foreground of the shot. Bullock running around trying to give the dog to the vulture is in the background but still in focus, hence the deep focus aspect of the shot. 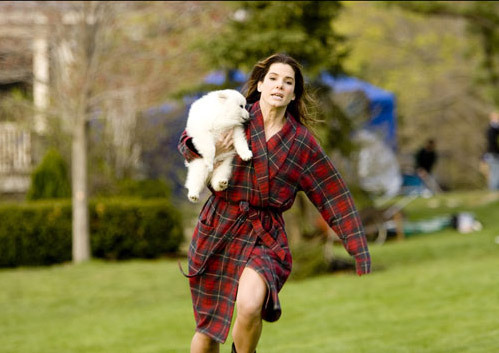 The grandma and mother exchange dialogue about how they think it is so sweet that Bullock’s character is playing with the dog after she had previously implied she did not like the animal. To the viewer, this creates humor because we know that she is trying to get rid of the dog, but her future ‘in-laws’ think she is trying to play with the dog. Another aspect a film maker has to take into consideration is the dialogue of the shot and what will be visually scene throughout the dialogue. Back in the early 1930s, George Burns and Grace Allen utilized something called “cross-talk” in short film comedies. Cross-talk is basically verbal banter through cross-channel conversation (Wolfe, 2011). So, witty banter is exchanged but also simulates spatial differences between participating parties. Cross-talk is still used today in comedic films. For example, the movie Bride Wars is a film starring Kate Hudson and Anne Hathaway and is about two best friends who have been inseparable since they were very young and now want to have their wedding at the same place and on the same day. Before they get into a fight, there is a scene when they are on the phone exchanging witty banter and are both doing different things than they say they are doing. This brings the audience into the film and relate to the characters because the fast paced talking forces the audience to pay close attention to what they are saying in order to understand what they are saying. The quick responses and witty one-liners add comedic elements to each character individually and also helps the viewer relate to each character. Ramaeker, P. (2007). Notes on the split-field diopter. Film History, 19(2), 179-198. Wolfe, C. (2011). ”Cross-Talk”: Language, Space, and the Burns and Allen Comedy Film Short. Film History, 23(3), 300-312.